Herff Jones is a proud partner of St. Jude in the fight against cancer and the hope to finding a cure. Our sister company, Varsity Spirit, is also a proud partner and has teamed up with St. Jude to help support the cause. Now through May 15, 2016, Varsity Spirit will donate 50% of the purchase price on two different hair bows. 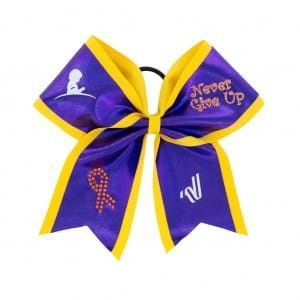 These bows were designed by a St. Jude patient and former cheerleader and are called the “Never Give Up” bows. They are beautifully designed and you do not have to be a traditional cheerleader to wear one! These are made for anyone and wearing one means you are a cheerleader to those fighting the disease. If you would like to learn more and buy a bow to support St. Jude, please click here. Yearbooks are something that will be looked at time and again over the years. Keeping yours in good shape will ensure you can pass it down for generations.